Usurp is delighted to be part of the BFI Love season. We are hosting a special 30th anniversary screening of the beautifully, transgressive film ‘My Beautiful Laundrette’ written by Hanif Kureishi and directed by Stephen Frears. Expect a night of love, poignant nostalgia and boisterous politics about we do now and in the future, with drinks and snacks provided. We are also screening a vignette interview filmed in 1988 in Mumbai with Saeed Jaffrey, a tribute to the great actor, who sadly passed away recently. Here are some quotes, photos and a short video. “Seeing this film again reminded me of what an impact it had had on my life at a time in 1985 when I was still coming to terms with my own sexuality. Thank you for screening this at Usurp, the effort you all put in with the food and festivities, and making this night a night to remember.” David, audience member. “It was great to see this film for the first time; I was very young when it was released and to think about all the issues that were going on then and now. I really enjoyed the Saeed Jaffrey film and the post film discussions. Thank you for making this a very special night and thank you for the warm welcome with the food and drinks.” Asha, audience member. “Thank you Usurp for making this such a memorable night. It is great to be able to have this in West Harrow as there is nothing else like this here to come to, please do some more!” Manisha, audience member. 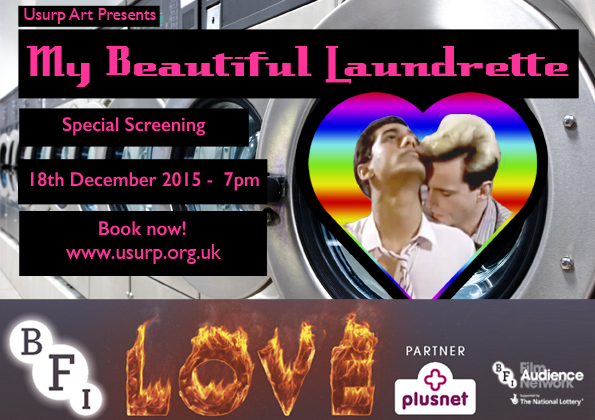 Thanks to BFI LOVE, in partnership with Plusnet, BFI FIlm Audience Network, Cinema For All.